Free climbing is the technique of ascending a route with equipment and climbing protection, but without directly using that equipment to assist one's ascent. Instead, the equipment is used solely for safety. In direct opposition to this, aid climbing is the direct use of climbing equipment to climb a wall. A basic aid pitch requires one to place a piece of protection. Once the piece is secure, the climber will clip an etrier or aider to that piece of gear. An etrier (which some people refer to as an aider) is a nylon ladder. The climber will climb up the etrier until she is as high as possible. The climber will then place another piece of gear and clip another etrier to this. An aid pitch requires one to do this repeatedly as he or she works up the route. A big wall climb is a route that is so big, that it generally takes more than a day to complete. 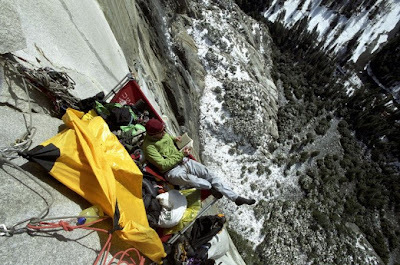 Many walls require one to haul bags full of food, water and equipment as well as to use a portable ledge (a portaledge). This type of climbing can be equated to vertical backpacking. Most big wall climbs require a great deal of aid climbing. Part of the reason that one must sleep on the wall is because aid climbing is incredibly slow. There has to be a piece of gear of some sort every six feet. If a climber is not quick with her system, then the time will add up very quickly and aGrade IV will turn into a Grade VI. Hook -- This is literally a hook that one might use as a piece of protection. A climber will put a small metal hook over a rock lip and then clip the etrier to it in order to move up. Jumar -- The second (the follower) on an aid pitch is required to climb the rope instead of the rock. The second will usually do this with mechanical ascenders called jumars. The act of climbing up the rope with these is called jugging. A1-A5 -- The aid grade system. An A1 placement is perfect and could hold a bus. An A5 placement is really bad and will only hold bodyweight. Daisy Chain -- This is a personal anchor system with a series of loops sewn into it. A climber can place a hook (called a fifi hook) on her harness an hook the loops of the daisy to shorten it. Hauling -- The act of dragging a bag up the wall. This is the most miserable part of an aid climb. Copperhead -- A wire with a maleable copper top. These can be pounded into a crack and will usually hold bodyweight on high end aid climbs. Nailing -- A pitch that requires the use of pitons. The following videos provide an introduction to aid technique with a focus on the methods required to climb a big wall. At AAI we will begin teaching aid and big wall technique in a classroom format for the first time this summer. Previously, we have only taught these courses on a private basis. This summer we will be offering aid and big wall technique in Part III of our Alpine Mountaineering and Technical Leadership series.